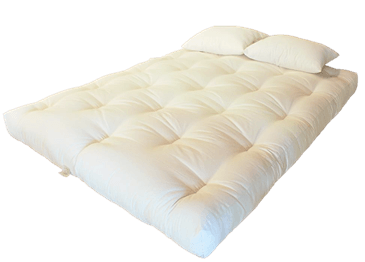 Green Cotton & Wool Foam Core Dreamton futon - Best selling in USA Mattress. The DREAMTON with a 2 inch Evergreen Foam core wrapped with Pure Wool is one of our best selling natural futons. 100% Green Cotton, a two inch piece of high density Evergreen Foam, which serves as this Natural futons' core, adding resiliency and shape plus an outer layer of Pure Wool. This futon is made primarily of 100% Green Cotton with no chemical fire retardant. This cotton and foam core and wool futon is softer and more responsive than the All Cotton futon. If a customer is looking for the most natural product possible, we would recommend mattresses and bedding made from raw fibers such as cotton, kapok, and wool: these are unprocessed and close to their natural source. However we do try to offer foam cores for comfort, budgetary, and sensitivity reasons.